ZZ Plant has become increasingly popular in recent years and I believe it deserves all the attention it's been getting. Give ZZ indirect light and infrequent watering. 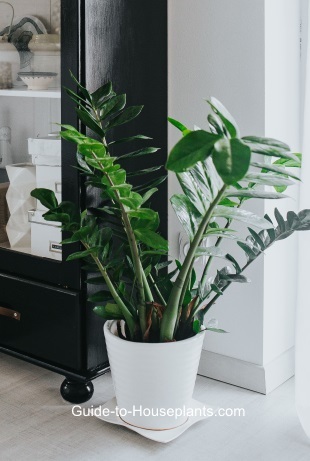 The Aroid family has given us more dependable house plants than any other group and Zamioculcas zamiifolia is no exception. 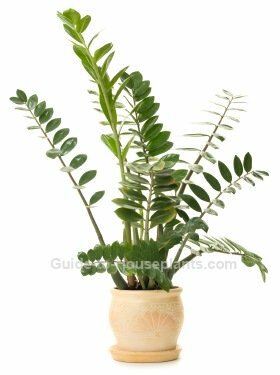 This is the only species in the Zamioculcas genus, and worth adding to your collection. ZZ makes a great room accent and practically thrives on neglect. This easy-going houseplant is forgiving if you forget to water, tolerates low light, and rarely needs fertilized. Want more? It also seems to shrug off pests. Growing from rhizomes, it has thick, upright stems bearing narrow, dark-green glossy leaves. Keep the leaves clean by gently wiping them with a damp cloth. Don't use leaf shine products, which can damage the foliage. A slow-grower indoors, ZZ rarely needs repotted. Eventually it will become over-crowded and need a bigger pot. It's best to repot in spring, when new growth begins. Use a small pot (no more than 2 inches (5 cm) wider than the old pot) with drainage holes. Overwatering is a sure-fire way to kill it. Z. zamiifolia is an African native, surviving drought by storing water in its thick rhizomes and semi-succulent stems. To avoid soggy soil, use a fast-draining mix. You can add sand or perlite to a potting mix or use a cactus mix. 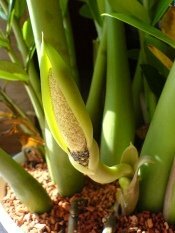 Small, insignificant flowers -- consisting of a spadix surrounded by a spathe -- may appear at the base of plants in summer, although ZZs rarely flower indoors. Watering Tip: Despite being drought-tolerant, your ZZ will be healthiest with regular watering. Water thoroughly then allow potting medium to dry out a bit before watering again. CAUTION: All parts of this plant are poisonous. Keep it away from children and pets who may play with or ingest this plant. Are your ZZ plant leaves turning yellow? You overwatered. Unfortunately, your poor plant is already suffering. The rhizomes are likely rotted in the soggy potting mix. Are the stems soft and mushy? It's time to replace your plant; it won't recover. Dropped leaves? You forgot to water. Yes, I know I say to allow it to dry out between waterings, but it won't survive without a drop to drink. Shedding leaves helps the plant survive during a drought in its native habitat. Brown leaves? Too much sun. ZZ plant will tolerate bright, indirect light to low light -- and everything in between. Dry, brown spots will develop on its leaves if you left your plant in hot, sunny window. Plant not growing? That's typical. It grows s-l-o-w-l-y, so you won't see much change in it. Ever. If you like a houseplant that you can virtually ignore, the ZZ is for you. It's a beautiful accent plant you'll enjoy for many years. 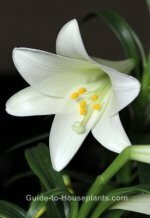 Height: Slow-growing, but can reach up to 3 ft (90 cm) indoors, confined to a pot. It grows much taller in its native habitat. Light: You'll get the best growth and healthiest plant by keeping it in bright, indirect sunlight, though it will tolerate low light. Morning sun is fine, but keep it out of hot, direct sunlight which can scorch its leaves. Water: Water thoroughly then allow the top 2 in (5 cm) of soil to dry out between waterings. Soggy soil will cause the rhizomes to rot. Yellow foliage and soft stems are also a sign of too much water. Although ZZ plant will tolerate dry soil, it will likely drop its leaves if left too dry, too long. Humidity: Average indoor humidity (around 40% relative humidity). If room humidity drops, use a room humidifier. Soil: Fast-draining medium works best to avoid root rot. Mix 1 part good-quality all-purpose potting mix and 1 part horticultural sand or perlite. Cactus potting mix works well, too. Fertilizer: Feed 4 times a year with a balanced liquid fertilizer diluted by half. It's a good idea to feed at the time of watering to avoid fertilizer burn. Propagation: Division of rhizomes. Leaf cuttings can be propagated. Just pull a leaf off the stem and stick the cut end in moist potting medium. Don't bury the leaf too deep or it will rot. Be patient -- the cuttings can take several months to take root and grow. New plantlets will grow around the leaf.